In Charlottesville, some folks assembled around the statue of Robert E. Lee to peacefully protest the removal of Civil War Memorials. 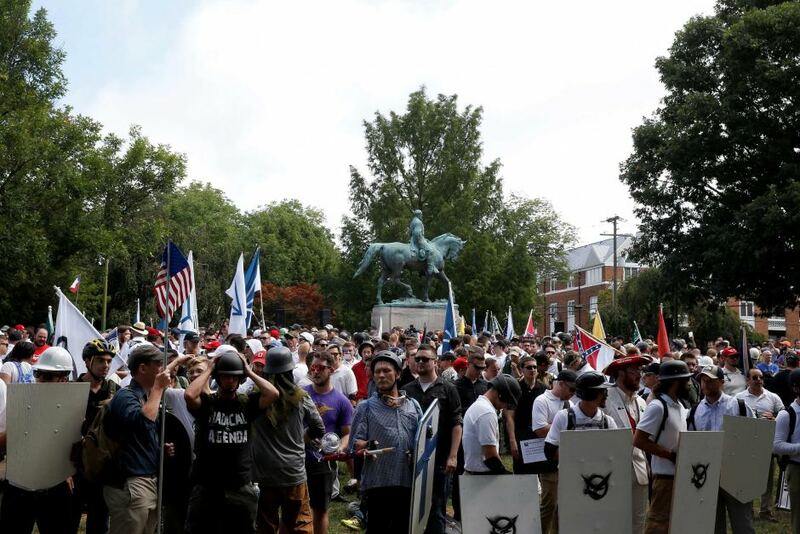 It was earlier this year that the council in Charlottesville voted to remove its Lee statue from a city park, sparking a lawsuit from opponents of the move and protest rallies. This was the peaceful protest. The folks with helmets and shields were there to protect the protest speakers because the local police refused to. Michael Signer, the mayor of Charlottesville and the Virginia Governor Terry McAuliffe blocked the permit application until the ACLU sued to allow the protest. Then they were attacked by Antifa and the BLM while the police stood down. Now the Left Stream Media is reporting that Nazis attacked the BLM. What many people do not realize is that the “Confederate” memorials are U.S. war memorials. This happened when CSA veterans were officially and legally recognized as U.S. veterans. I personally think that the statues and memorials should remain to honor our dead and commemorate the war that united our country once and for all. There is a Communist Revolution happening in America right now. The violence is coming from them. The propaganda spewing from the media supports the Communists and deflects blame. Like calling peaceful protestors “Nazis”. UPDATE: Police forced "Unite the Right" attendees to Walk Through violent Protesters or face arrest.Let's make this video go VIRAL. (y) Newly Press for more.